HI, I'm Jo. I am married with two teenage daughters which definitely keeps me on my toes! Hi, my name is Gwinny and I am married with two children. I started working for Jo in Autumn 2008 when she advertised for a class teacher on the school notice board. My friends pointed it out to me and suggested it was right up my street so persuaded me to apply and here I am! I previously worked as an analytical chemist and a clinical research associate in the pharmaceutical industry where I completed a chemistry degree via day release. After I married, I spent a year in Texas whilst my husband studied and I worked as a housekeeper and babysitter; I then returned to the lab. After 18 years in pharmaceuticals I then decided to have a career change and so I took off to college and completed a post graduate diploma in acting! Like Jo, two completely different jobs but both with a wealth of valuable experience. I would like to say how much we've enjoyed coming to the classes, they are everything you advertise them to be, and they have always been well run and organised. I've often found that even when Kieran has been reluctant to take part in classes, we have later been recreating songs (or what I can remember of them!) at home, and as a result of the classes we have bought a number of CDs/DVDs which provide hours of fun. I'm also really hoping that we'll be lucky enough to have another baby sometime next year and so next week may well not be the last you hear from me... i'll also be happily recommending your classes to friends and family. Jack and I loved going to Jo Jingles. There were lots of great visual associations which helped my baby to remember where he was, like the Jo Jingles toy who welcomes them and the surprise boxes with instruments inside. We preferred these classes to other music and movement classes as they have a CD musical accompaniment that everybody can sing along to. Jo Jingles covers some classic favourites, but they also have lots of their own songs, which we'd not heard before which was great! We particularly liked the tractor and train songs as it was fun moving around the room! We also liked the songs where we were able to play along to and do actions to, like 'Everybody do this', 'Sleeping Bunnies' and 'Until the Music Stops'. Jo Jingles has many 'baby appropriate' and safe musical instruments, with enough for mums and babies to have 2 each! We also used other props like colourful scarves, the babies enjoyed seeing them move and looking through them! The Hello, Goodbye and Thank You songs are always played and I think this routine helps babies to feel happy and secure, which promotes enjoyment and learning. We also learnt how to formulate vocal sounds to stimulate our babies speech. We were delighted to receive a certificate at the end of our course! Thank you Jo Jingles we will be coming back again! See you next year! With shakes, jingles and smiles. Just a note from Abigail and I to say a big thank you for a great party on Tuesday. Just a note from Abigail and I to say a big thank you for a great party on Tuesday. All the children, but especially Ella & Nellie, enjoyed themselves immensely. The parachute and balls will go down in party history we think - fab fun! My little boy and i attended the Jo Jingles classes on St Mary's Island. We both really enjoyed the experience. My little boy and i attended the Jo Jingles classes on St Mary's Island. We both really enjoyed the experience. Jo was a very enthusiastic "teacher" who clearly enjoyed what she was doing. The classes were very well thought out and Ewan loved the fun element of it. It was lovely to go somewhere where Ewan was supposed to be noisy and he liked the variety of singing, moving, actions and instruments and it really didn't matter if he got it wrong. I was impressed with the way discipline and routine were instilled in the children without them even knowing it. I took a few tips home and they worked. Keep up the hard work Jo! Lucy and i have been going to Jo Jingles for three and a half years since she was six months old. Lucy and i have been going to Jo Jingles for three and a half years since she was six months old. We have had a couple of different teachers but have found all of them very enthusiastic and fun. 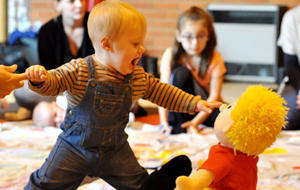 Jo Jingles has helped Lucy develop all her social skills and she has developed into a very rounded and happy child. 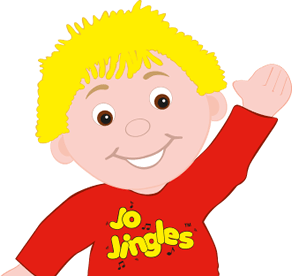 I believe that Jo Jingles encourages good concentration and group participation. Lucy wasn't the most confident child in the group but it helped her to learn that she had her place and she joined in when she felt comfortable. The structure of the class is very good and i feel it enables the children to understand clearly when things start and finish and are made to take turns and see that everyone gets a go. Lucy's rhythm and musical understanding is clear to see and she loves to dance and listen to a wide variety of music at home which i believe comes from doing her Jo classes for so long. Jo Gilbey is a fantastic teacher and has developed her classes and there is something new and different every week, from cheer leading pom poms to colours, shapes, animals and all the seasonal events too. 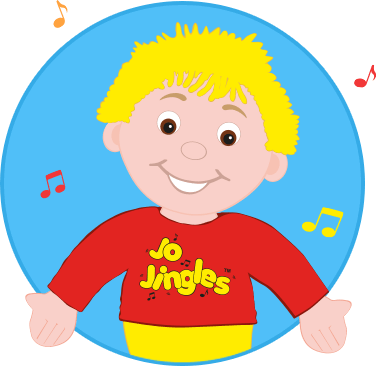 Lucy has learnt a lot about life as well as music from her Jo classes and we thank Jo for all her hard work in making Jo Jingles such a fun and enjoyable experience. Lucy is now moving on to big school and my little boy will get to carry on instead. So i'm looking forward to some new things in the classes ahead!! Kieran and I would like to thank you very much for your wonderful classes, which we have attended for the last 3.5 years. Kieran and I would like to thank you very much for your wonderful classes, which we have attended for the last 3.5 years. We've both had a fantastic time and are sad to be leaving. Kieran has not only had lots of fun learning all about the weather, jobs, colours and many other subjects over the years, but he has learnt discipline in class which has made me very proud and will be a wonderful head start when starting school this year. You've made the classes great fun with your enthusiasm and patience with the children. I just wanted to write and tell you how much my 2 daughters and I have enjoyed our Jo Jingles classes over the past four years. I just wanted to write and tell you how much my 2 daughters and I have enjoyed our Jo Jingles classes over the past four years. Jo Gilbey our class teacher is amazing, always enthusiastic and smiling, giving each child plenty of attention to make them feel special. Jo's class has always been the highlight of our week. I'm amazed that Jo can continue to keep coming up with new fun ideas and themes to incorporate into our classes. Most recently we were covering colours and each week the children were encouraged to come wearing that colour. My daughter Isobel loved looking in her wardrobe to find that weeks designated coloured outfit. My favourite theme was the magic train ride where each week we would journey using our own magic ticket to a different land. Jo's classes have helped to foster my girls love of music and has also built their confidence. I will really miss attending Jo Jingles when Isobel starts school next year, can mummies come on their own? Over the years I have tried several other preschool classes but Jo Jingles is by far the best. I think this is largely down to the passion and creativeness of Jo Gilbey. We have now retired from Jo Jingles, and I say "we" as i enjoyed it as much as my little Katy. We have now retired from Jo Jingles, and I say "we" as i enjoyed it as much as my little Katy. Here's our story - I saw a flyer in the library for Jo Jingles and we signed up when Katy was 8 months old. The classes were very entertaining for Katy and she would bounce away on my knee to the music and "play" the instruments. It was a joy to see her progress through the classes and gain so much enjoyment from them. When she joined the older class she was reluctant to approach the front of the class on her own, but the classes gave her the confidence to over come this and it was a proud moment when she did so on her own. Also the acknowledgement and presentation of the certificates for the milestones (dry as a bone and taking her first step) achieved in the classes were a lovely touch. Jo, you became very special to Katy and you always had time for her when she wanted to show you her rabbit (even though she took him along every week) or when she had a story to share with you. 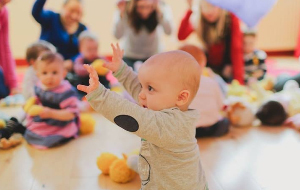 We would recommend Jo Jingles classes without hesitation but with a little advice : mums / dads/ carers get involved too, if I can dress like a pirate anyone can and the more you dance along your little one will too, it's like a free workout too!! 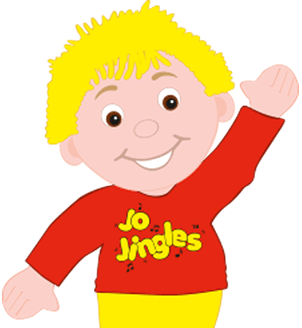 Jo Jingles has left us with lots of happy memories, (we still put the Cd's on and have a dance around) the class was fun, entertaining and a good learning tool. It was all the better thanks to the lovely Jo who will always be special to us.